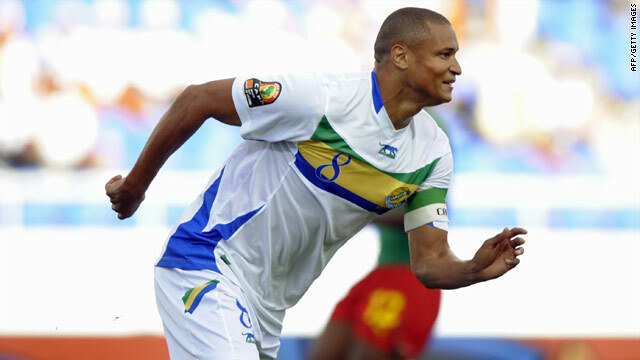 Daniel Cousin celebrates scoring the only goal as Gabon secured a shock 1-0 victory over Cameroon. (CNN) -- The African Nations Cup threw up another upset as Gabon shocked much-fanced Cameroon 1-0 in the opening Group D game in Lubango. Hull City striker Daniel Cousin took advantage of a defensive mix-up to grab the only goal after 17 minutes -- and no amount of Cameroon pressure thereafter could produce an equalizer. The victory was only Gabon's second-ever in an African Nations Cup match. Cameroon did all the early pressing with Landry N'Guemo going close from a tight angle before Didier Ovono had to turn Achille Emana's snap-shot from the right channel on to the post and out for a corner. It was against the run of play when Gabon snatched the lead with less than 20 minutes gone. Cameroon's defence got themselves in a mess, allowing a mis-kicked pass from Cedric Moubamba to find its way into the path of Cousin, who slipped a low shot past Carlos Kameni. Cameroon almost responded moments later as Alex Song surged forward. The midfielder was brought down on the edge of the area but the referee waved play on as the ball fell for Pierre Webo, who saw his low shot saved. The second half took time to come to life but Emana almost scored an explosive equaliser with a long-range half-volley out of nothing that flashed wide. A quick free-kick just before the hour mark released Emana inside the area but as he closed on the goalkeeper he sliced his shot horribly wide. Cameroon were struggling to get star striker Samuel Eto'o involved and his first decent shot from inside the area was deflected wide. Emana then forced a good save from Ovono before substitute Somen Tchoyi flashed a powerful shot wide, but it was beginning to look like it might not be Cameroon's day. Ovono made a good save to keep out Geremi's deflected free-kick in the final minute of normal time and Song then sent Cameroon's last chance over the crossbar. Gabon almost sealed it when Pierre-Emerick Aubameyang smashed the ball against the crossbar in injury time, but Cousin's strike proved enough. Meanwhile. Zambia and Tunisia failed to take advantage of Cameroon's shock defeat as they drew 1-1 in the day's other match. The Zambians will be most disappointed not to have got off to a winning start after largely dominating the game and seeing a late header from substitute Emmanuel Mayuka ruled out for offside. They took the lead in the 19th minute when Jacob Mulenga unselfishly played the ball back to James Chamanga in the box and his weak shot dribbled under Aymen Mathlouthi and into the net. Kalaba had a shot blocked just past the half-hour and Zambia looked likely to add to their tally until Tunisia equalized out of nowhere in the 39th minute, Souheil Dhaoudadi slamming a cross by Youssef Msakni into the roof of the net. The Tunisians started the second half stronger but Zamiba soon came back with Kampamba Chuntu missing a header in front of goal and Chamanga providing a constant thread. Kalaba had the best chance in the 69th minute when he rose to meet a superb deep cross from Christopher Katongo but directed his free header into the ground when he should have scored. Zambia pushed in the last 10 minutes with Mulenga driving a shot into the side-netting before Mayuka thought he had won it with his first touch only for the referee to deem otherwise. Was Angola ready to stage Cup of Nations?